Beginning around March, outdoor work really kicks up here in the country. This amounts to cleaning up debris left over from the winter, tidying flowerbeds, trimming dead branches, etc. Then preparing the garden patch and beds for planting. While it’s rewarding when it’s finished, at times I wish I lived in a condo near a big park. Well, not really but it is tiring. This is also one of the most beautiful times outdoors here in southern Indiana. The trees start sporting a haze of pink and purple buds, understory trees like Dogwood and Redbud assault the eyes. Other times of the year, you wouldn’t even notice their scrawny selves. Spring also displays some of the most beautiful shades of greens from lime green to sea blue. By June, the woods and fields display a pretty even state of crayon green. Not my favorite color, I admit. Strange for a landscape painter. This is also the time of year when I’m torn between my “have to” garden work and my vagabond painter self who just wants to toss the gear into the car and take off. I usually manage a bit of both. 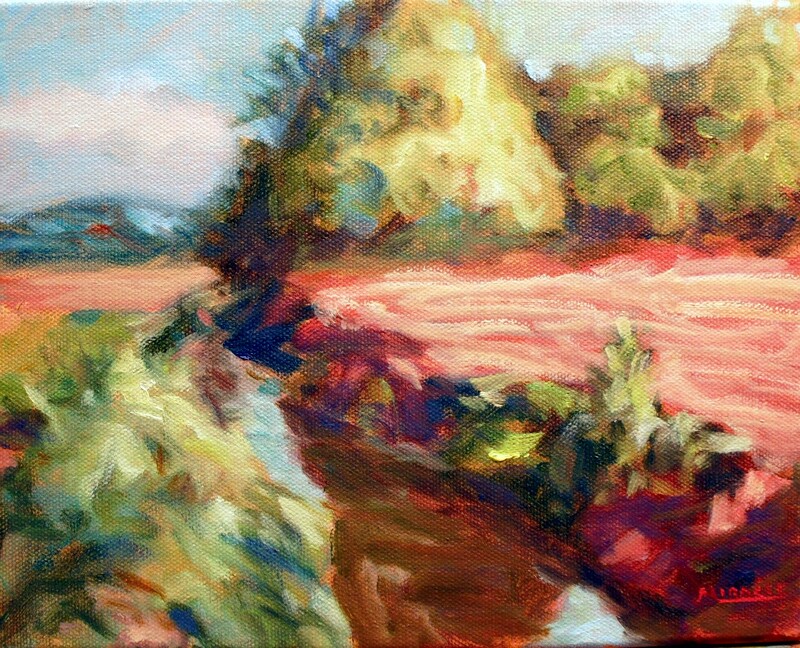 Below are an assortment of a variety of spring paintings, some quite small at only 8 x 10, which is far smaller than my usual sizes. 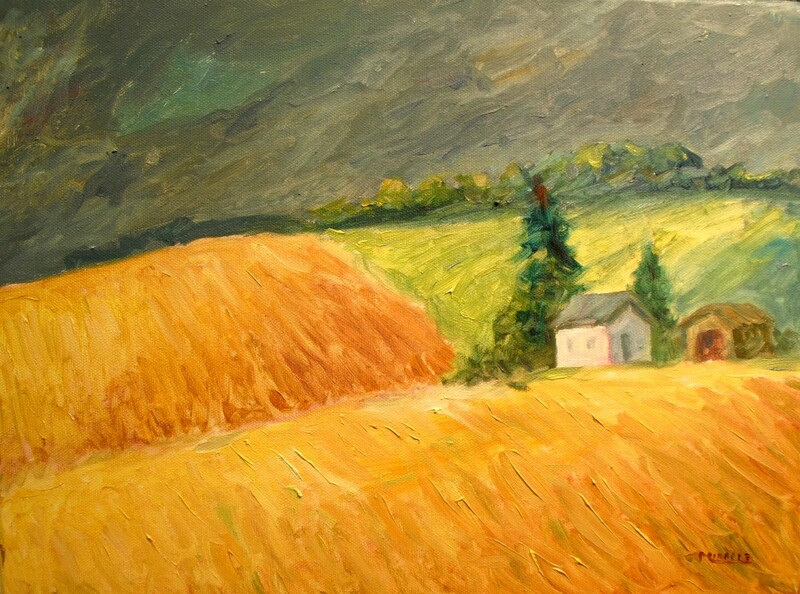 And, I’ll admit, while it’s always a joy to dive into the spirit of painting, the results are not always so great. Well, I tell myself, I always learn something. Even if it’s only something of what not to do next time. As usual, I always welcome your comments and feedback. Don’t be shy. One of the most interesting colors is the limey-greenish-yellow of fields of wild mustard. 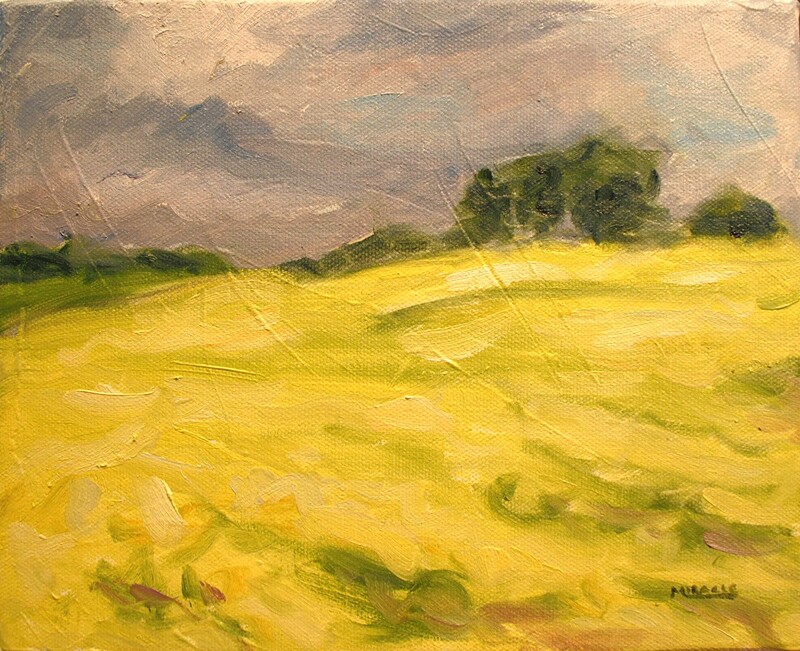 I spotted this field one day with a dark grey storm rolling in which really set off the yellow. I did the first one from memory but it looks more like a Van Gogh spin-off. Later I went back and painted it from life. I think I like the second one better. This is a creek that I pass on my drive to work. Mostly attracted to the reflection in the water which is always a challenge. Again, from memory. 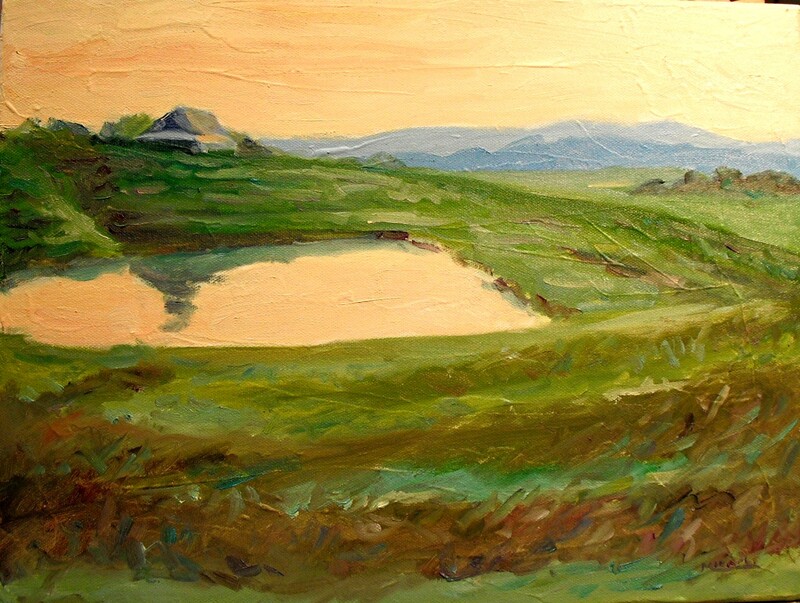 And another drive-by painting of a farm with the distant blue hills, hazy sunrise and pond reflection. And this painting was started outdoors then brought inside. White oak trees have the most interesting spring green color with racemes of flower/pods. I didn’t quite capture it but it’s a good start. Since it’s near the house, I will try to paint it under other conditions and seasons. 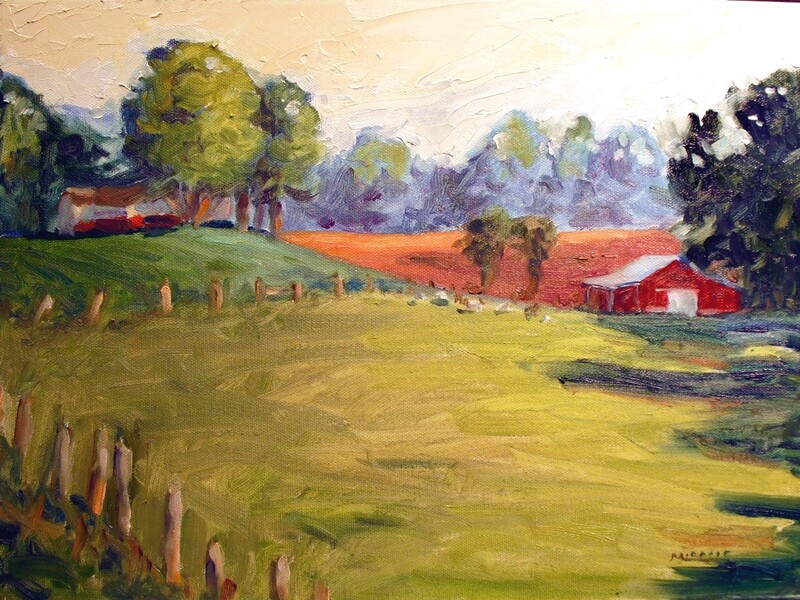 The final painting that I just completed is a goat farm that I pass each day. I love the evening shadows. They usually have about 30 goats but I thought that would be overkill. 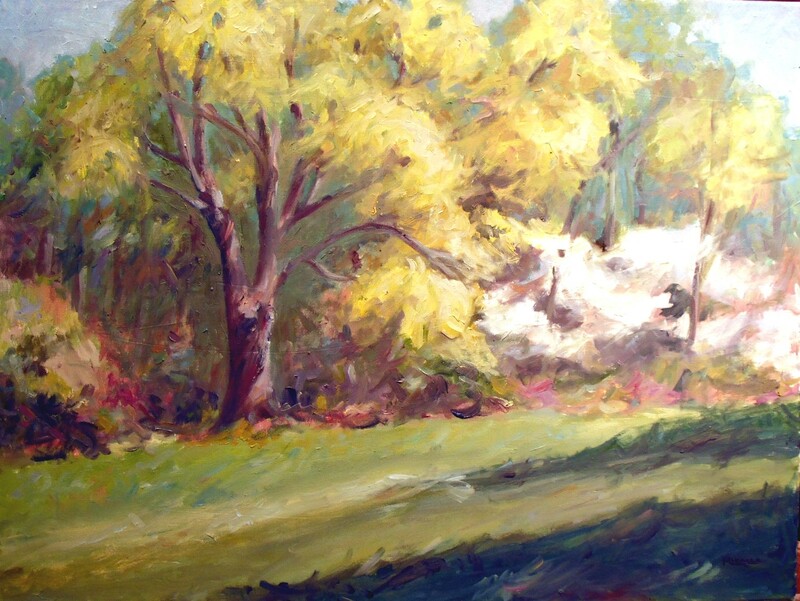 This entry was posted in country living, oil painting, plein air painting and tagged country living, kit miracle, landscapes, oil painting, spring landscapes. Bookmark the permalink. Lovely painting!! Like the style!! Thanks, Lianne! It’s always rewarding to get feedback. I’ll check out your blog, too.